Listening to Nick Carroll speak about decades of surfing, paddling and writing about surfing is like plunging into saltwater over and over. 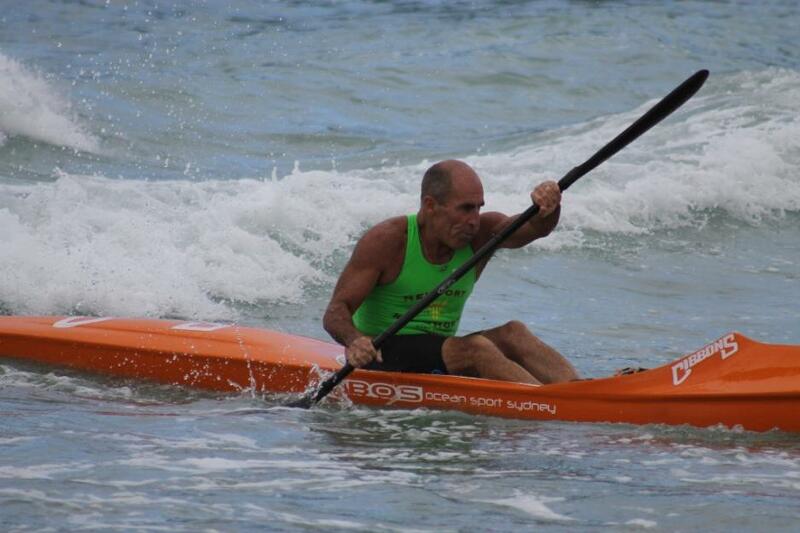 The men's division national champion in 1979 and 1981, which was preceded in 1977 as runner up at the Australia National Titles, 30 years later, when a young 48, Mr. Carroll went in the famous 32-mile Quiksilver Mokokai-to-Oahu paddleboard race. The other passion is plain speaking in text, a wordsmith whose articles and books appear in all formats in publications that range from Australia’s Financial Review to online forums where a land locked would-be surfer in Holland is asking him how to stand up with a tail end question that somehow relates to ducks, not ducking under a wave. First wave, first break – first wave you stood up on? The first time I stood up on a fibreglass surfboard was just out here (Newport) in April 1972. It was a little rip-bowl kind of wave, a little right-hander peeling along into this gutter, about a 1-2 foot wave. I paddled into this little wave on an angle and stood up – it was one of those moments where everything feels exactly right, everything was in the right place. I’ve never really forgotten that. What was your first surfboard, who made it? My first board I bought from a school friend called Nigel Savage – it was a 5foot 8inch, round square tail, single fin with a little round nose on it. Later I found out it was the same board that Nat Young rode in the 1970 World Contest finals at Johanna (Victoria). I didn’t find that out for 25 years though. Who are your surf heroes and why? I don’t really have any surf heroes anymore. I did when I was a kid. There was Michael Peterson, from Queensland, all the big Narrabeen guys like Col Smith and Terry Fitzgerald, Simon Anderson, Barry Kanaiaupuni from Hawaii. What they were doing just seemed like magic to me – it’s really hard to see that time now, the way it was at that time, the early ‘70’s. So little of surfing was known; it was still a thing that was known just among a few people around the world. The skills of the surfers were just exploding at that time, driven by the kind of surf they’d started riding (Oahu for instance) and the advances in board design where they’d gone from long boards to short boards. As a result their skills were just exploding and it just seemed like magic to me. Were you tempted to join the Hippie Trail? No. I think I was of a generation who thought of hippies as – have you seen a show called ‘The Young Ones’? The hippie archetype on there was a character called ‘Neil’? That, to me, was what hippies were like – kind of mopey, people who didn’t actually do much, and we were super energised young men. We just wanted to grab the bull by the horns. I don’t know; I’ve had some awesome waves, some incredible waves. I couldn’t really pick three waves per se, individual waves; there’s just too many of them. It’s funny – I tried counting them about 15 years ago to see how many waves I’d surfed and it was getting close to a million at that point. But surf spots – my favourite surf spots would be Sunset Beach in Hawaii – it’s just a fantastic big challenging wave. It takes a long time to earn your stripes at Sunset. When did you first surf there? 1981 – I got to be among a group of surfers who surfed there every year for many years. We got really close and really understood what each other was doing out there; it’s a big challenging wave, it can scare you – a lot of people can’t cope with it, but it just clicked with what I wanted from surfing. A lot of paddling, a lot of energy in the wave, you go incredibly fast, it’s a huge amount of ground you cover. It’s like hunting; you’re hunting a wave at Sunset – the waves are everywhere, it’s confusing, it’s big, it’s frightening – you’re hunting a wave. Surfing to me feels a bit like hunting; you’re in a wilderness environment tracking something down. Then Grajagan in Indonesia; the tip of Java – it’s just an incredible wave. I’ve never had a bad surf there ever. 1988; I’ve been there a few times and every time it’s been incredible. Once again a really challenging wave, a dramatic wave – big reef wave, long wave. The experience of surfing it; you can ride in the tube there on a big day for a long time. I’ve spent a long time in the barrel there just looking around, adjusting your lines. When it’s big out there there’s a lot of room, there’s not too many people out surfing it when it’s fairly big. I really like surfing my home break. Newport Peak; it’s just fun, a really playful wave. The Newport Plus Board Riders – how did that come about? There weren’t really any older surfers at Newport at that time, in 1975; some of them had gotten into the heroin and fallen by the wayside, others had gotten into motorbikes and it just dissipated. When myself and my brother and a few others were just coming into surfing, at the age of 14 or around then, there wasn’t anyone around above us – it was like the waves were ours, we could do what we wanted. We’d tried to join other clubs; there was a club up at Palm Beach called Peninsula Board Riders, some joined it and some of the other guys joined North Avalon Surfriders Association – NASA, but they both seemed a bit flat to us. So one day we ran our own contest here and suddenly realised ‘we can just do this’ and from that ‘we’ll just have our own club’…so Bang! Off we went. Derek Hynd won the contest, Tom was second and I was third. Which is pretty symbolic really (laughs out loud)…. It set the tone for a while. Captain Cook’s recorder makes a journal entry on ‘surfing’ translating into ‘wave sliding’ in Hawaii – you have 40 years clocked up in the sport as a participant and then in the industry – when you think about its culture do you connect with more contemporary expression of that or reflect on its beginnings? Frankly I feel really deeply connected to the Hawaiian traditions, to it all going back to there. For me that history, where the whole sport came from, ‘wave-sliding’ , and this may be because I’ve spent so much time in Hawaii absorbing that culture and having a lot of respect for that – I’ve learnt a lot in Hawaiian surf and from Hawaiian surfers; so it resonates to me, is still quite present and alive even today to me. When I stand up on a surfboard or paddle a racing board out or paddle a surfski – whichever it is, they are all interrelated and strongly woven together. Of those Hawaiians you have met, with these traditions still intact, who stands out? That’s a complex one (laughs); I’ve learnt a lot from all the lifeguards I’ve met over there, guys like Darrick Doerner, Brian Keaulana and Dave Yester – guys like this are enmeshed to the full depth in the ocean experience in Hawaii. I’ve absorbed a lot from them, and they’ve taught me a lot about respect, took me into the family a bit and gave me the sense, that I’d always had without being able to categorise it, or explain it, that there is a real deep spirit inside surfing; not like a religion but a deep ongoing spirit and a way it’s a ‘live your life and hear it in the experiences you have with the ocean’ – look at it, it’s so much bigger than us, so full of energy and untameable. I know I feel quite small in relation to the ocean and I think that’s really healthy – this is something people look for in their lives; something they can feel small against. What sort of books was your mum reading and how did she share that knowledge with you? We had a lot of books at home when I was a kid, tons of books. I had no idea what they were. I read all of George Bernard Shaw’s plays before I was 10. Man And Superman cracked me up because I was also watching Superman cartoons on TV. My mum felt to me like a very sharp witted person, her mind was really really sharp – I didn’t get to spend nearly enough time with her. My dad also has a really sharp mind but is quite a relaxed person compared to my mum. In the end her mind kind of worked against her and in a way contributed to her death as it drove her to anorexia – anorexia is a disease of an active mind turned against the person. It might have been better if she hadn’t been so smart. I remember talking to her not long before she died and asked her ‘do I have some sort of gift?’ …and she said ‘well, I think you’ve got a good brain.’ And that stayed with me. Were you writing when you were young? I wrote quite a few little stories, but read more than I wrote until I got a bit older. Your first interview – were you scared? Yeah, I was petrified. It was with a really famous surfer called Gerry Lopez and I was only 16 – I was scared. What questions did you ask? Were you a fan? What it was like to surf the Pipeline – things along that vein. I didn’t even think Gerry was real – he was like this figure on the movie screens, and I couldn’t believe I was actually meeting him. To me he was like a wizard. In fact he was just a really nice guy and he saw how I was and quickly put me at my ease. He had a bunch of friends with him though and the friends just thought I was hilarious. They were just looking at me and chuckling. There is a seeming tradition among older surfers to look after those coming up – to invest time and energy in instilling surfing’s traditions – love of sport, ocean – having respect for others – you also invest your time and energy here with the Newport Surf Academy - what to you is the best thing about grommets? These people here are all like my nieces and nephews; there’s not much gap between us. They give me cheek all the time but are also really respectful. One of the contrary things about surfing is that there are so many men who have done it for years and years, have done this thing that is tremendously pleasurable and for some reason it’s done them no good at all – they’re frowning, they’re bitter, they don’t want other people to surf with them, they’re angry a lot. I think this may be because they’ve become selfish about surfing and the way out of that, to me, is just to give it away to everyone – especially to kids. For example when I’m out surfing at the Peak, there will be a bunch of older guys who may be being a bit klutzy, and I’ll ignore them, but the kids, I’ll just cheer them on – cheer them into waves – share it around a bit you know. That’s the healthy thing to do with something you love. In word-smithing – you’ve gone from Tracks to current editorial consultant at Morrison Media and have pieces being published in the Financial Review – that one about Michael Peterson – you obviously felt quite close to him? Well only because he was a hero of mine – he was a surfer and I saw a really deep pathos in what happened to him. I also came across a blog-style online forum ‘Ask Nick Carroll’ on Real Surf – which is hilarious – that’s a wide gamut of media – Tracks, Surfer Magazine, Books, Financial Review, and The Australian – and then ‘Real Surf’ where you’re answering ‘how to surf’ questions by people living in almost surfless landlocked Holland with a tailpiece about ducks for some reason – how do you shift gears between these quite different forms of media? There’s a big difference between these – I think it’s all in the context and understanding the context. I don’t change my voice much. Like with the Financial Review, I’ll go to them and suggest a story which I feel is a bit more of a complex idea and might shed some light on surfing to people who don’t surf much or at all. The subject matter when I write for the Fin. Review is extensively in a surfing context but the story is about something else – for example the piece that was about MP was extensively about what is the truth about someone’s life – should you just apprehend someone’s life and turn it to fiction, without saying so, or is it really weird to do that, or is it modern fiction? I was baffled and wrote the story in one way to try and figure it out for myself – so it relates to context mostly (whichever media/medium is used). You have a reputation for integrity in the pieces you put out – the articles, books – there’s an honesty, a truth – do you have a creed there or is more that you’re just using your voice and this is going to come through anyway? I have a fairly constant awareness of my own failings as a person – so it may seem like that, but I’m aware that I have made some terrible mistakes in my life. I don’t think in terms of my own integrity. Who is your favourite poet or writer? My favourite book at the moment is F Scott Fitzgerald’s The Great Gatsby, which is hilarious because I never read it when younger and I’d started thinking to myself, before that movie, ‘why haven’t I read The Great Gatsby?’ – and so got hold of a copy and read it and was just dumbfounded by Fitzgerald’s wit and prose – it’s just diamond sharp and the story itself so fantastic. The sense that he doesn’t know where he’s going with it seems to come through a lot of the time; he obviously does but a sense of that – the way the whole thing changes two thirds of the way through and he starts going back over events and seeing it again – it blew me away. Every aspect of it – he has stretched every aspect of the modern novel in that book. So that is my favourite book right now – it hasn’t always been and may not always be. Are you ever going to publish your own Collected Works? Probably not. Websites are great for aggregating huge amounts of material – makes the material permanently accessible and might be useful for people researching subjects. So I’ve been toying with the idea of maybe getting all the articles I’ve ever written about anything and putting them all on a website under different categories. As for books – I try to do something different, something original each time I write those – so a collection’s not for them. Your progression from surfboards to being involved in the surf life saving movement – how did that come about? We’d been living in California for quite a few years and we moved back here and my daughter had grown up a bit in that time, she was 7 years old when we came back here. One of the first things we did when we got home was I brought her down the beach to go swimming and she saw the clubhouse building and went ‘there’s a club on the beach?? !’ and straight away wanted to be into it. So she joined Nippers and I would come down to look after them in Nippers a bit and was struck by there not being many adults in the club who knew a great deal about the ocean and so thought I wanted to get involved and help out. So I helped out with her for a while, then she got over Nippers and so I extracted myself from the club for a couple of years but then I’d done a couple of big paddle races, the Molokai Race in Hawaii, and really got into paddling, and so came back to the club partly because of that. I started doing patrols, then got into coaching the kids and it’s gone on from there. I feel like, to me, all the surf sports that we do here (Newport SLSC) are the Australian version of what the Hawaiians do on outriggers. I feel there’s a close link between the two. I remember a couple of years ago Tom and I were invited to go to the outrigger surfing championships at Makaha, which is a big honour for haoles (white foreigners), and we just went, yeah we’re going! We went over and they set the beach up and it was just like a surf carnival. There were a bunch of those pop-up tents, everyone having barbecues on the beach and everyone having these crazy outrigger races – it was just like a surf carnival – so I see that as a real strong connection. Excelling in the water and seeing the generations pass through the club appeals to me. 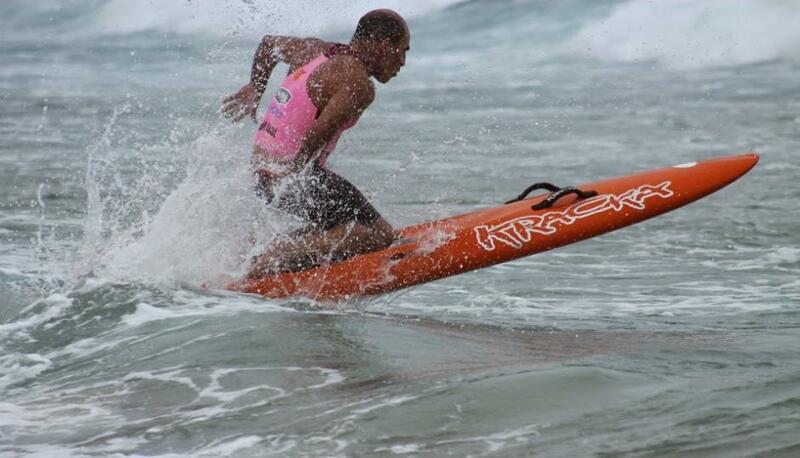 These kids (Kinghorn Newport Surf racing Academy) are just so good in the water – it’s just ridiculous. You have taken up paddling big time – you’re in every paddling comp there is, passing people in the water – there’s steam coming up the back off you – why? What’s the best thing about continuing – going in the Master’s Comps., going in the Lion Island Challenge and other surf sports – is it a life affirmation? For me it works hand in hand with going surfing – I’m 54 years old and never dreamed when I was a kid you could surf beyond 30. I feel now I can surf almost as well as I ever have and a lot of that is because I get in the water in other ways that help me recreate surfing for myself over and over. So there’s a bit of that going on – probably most of all. 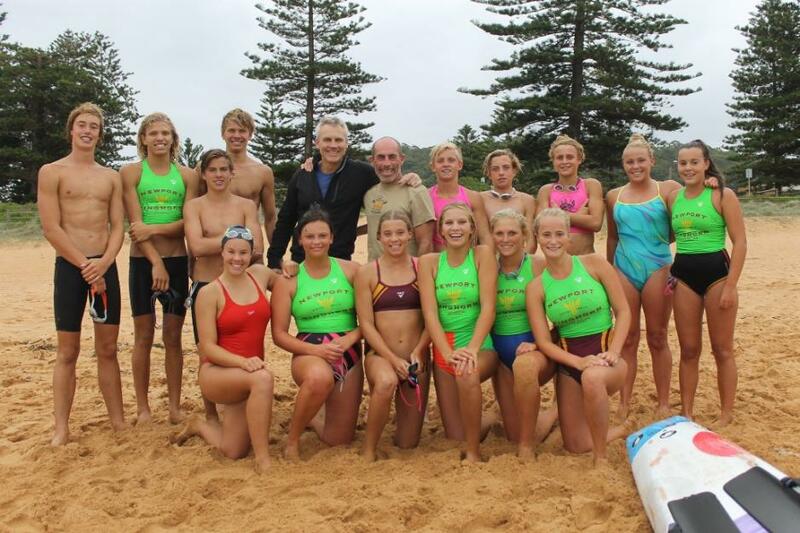 The Newport Kinghorn Surf Racing Academy – Be the Best, Enjoy it the Most – you were in at the ground floor – how did this eventuate? We went though this whole thing with Nippers and Maddie, pulling back from the club then getting involved again, this would have been around 2003, and there were a couple of girls that wanted to do a bit of board training, and I had the Molokai paddling experience, so I weighed in with them a little bit. Then around 2004 there was a cluster of boys who also wanted to do it – four under 10’s who were really into it, really wanted to do the training and they could swim like fish too – so I got into training them too. There was a couple of other adults around too – Marty Cowper who was partners in the girls training with me – and we had this idea around 2004-2005 that we should have a five year plan. We needed a general idea about where we can go with this. Then one of the kids, Max Brooks, his dad James got involved. James is a really good swimmer and was into swim racing when he was younger. He immediately thought this was the best thing ever and he really got stuck in and got those kids even more committed then they already were. Yes; we will win Aussies – maybe not this year, maybe not the next year, we will win Aussies though, and we’ll do it with smiles on our faces. Captain Goodvibes – what’s with Captain Goodvibes and you; is that what attracted you to Tracks? Yes- that was the first thing I looked at when I went into the newsagents – I think the cover was ‘Let’s put the fun back into surfing’ issue, and that was it. It was incredibly risqué but was a product of the artist, Tony Edwards, a very creative guy – he just saw so many funny aspects to the surf culture and he had to go in on it and hit it pretty hard and did and it was just superb. Every surfer recognised a little part of Goodvibes in themselves and that’s what made it magic really. Is that why you wanted to go to Tracks? It started out there. At the time there were two surf magazines in Australia – Surfing World, that was the serious surfing magazine, and Tracks, which was the crazy surf magazine, and part of me is just drawn to craziness. Plus the editor then – Phil Jarratt, a really really great journalist, he really encouraged me, it was great having that sort of encouragement. Do you see much of what he’s doing now? Is there a bit of a shift there? Oh yeah – there’s a big shift there. I’ve been hoeing through his book That Summer in Boomerang; it’s very serious – Phil’s light touch seems to have gone but that may be the subject matter – he may have felt really heavy about it. If you could be another creature for a day, furred, finned or feathered – what would you be and do? I’d probably be a shark, a Tiger Shark, mainly because I’ve always wondered what it would be like to be a shark – what do they see and what do they smell, what do their brains work like? I’d hang around Newport Reef – I’d think I’d come swimming here. We see a lot of sharks when we’re doing paddle backs – if you’re a shark you want to hang outside the headlands – it’s too shallow in here. To many you’re a champion – not just because you’ve won early surf contests when there was little money or kudos attached to them, but also due to the way you conduct yourself as an individual. How do you deal with that kind of recognition, the impact you’ve had on other’s lives simply by being yourself? I feel a bit awkward about it – I’m flattered but I don’t strive to be that really. How do you create a champion, what would be the three or four pieces of advice you’d give – what do they need? An example could be, I guess, in my fundamental approach to these kids (Newport Surf Racing Academy); and that is, if you want something that’s really worthwhile and valuable, then you are going to have to work for it. Make no mistake about that – you are going to have to work for it and you will probably have to work really really hard, there’s no short cuts. A lot of the squad are doing their HSC this year – how will they balance all the training with their studies? Quite a few of them have already done their HSC and we worked with them on keeping a balance in that, but the important thing is that hard work is fun, hard work doesn’t have to be depressing and grinding and tortuous – it can be play too. That’s why our motto is ‘Be the Best, Enjoy it the Most’, because there’s no point in being the best unless you’re enjoying it. Right out the tip of Newport Reef in a really big and good easterly groundswell. There’s a rock platform and waves break on it and they’re epic waves – but really difficult to ride – so I’d say that’s probably my favourite place. I don’t really have one – in phrases – that would change every day. I think what I have is a favourite way of writing a sentence. Virginia Woolf said something really great about writing a sentence, that everybody writes their own particular sentence, and what you want to do as a writer is get as close to your sentence as you can, and then you’ll write it over and over again. So I guess what I try to do is write that sentence… every day. Some of the Kinghorn Newport Surf Racing Academy with James Brooks and Nick Carroll - February, 2014. 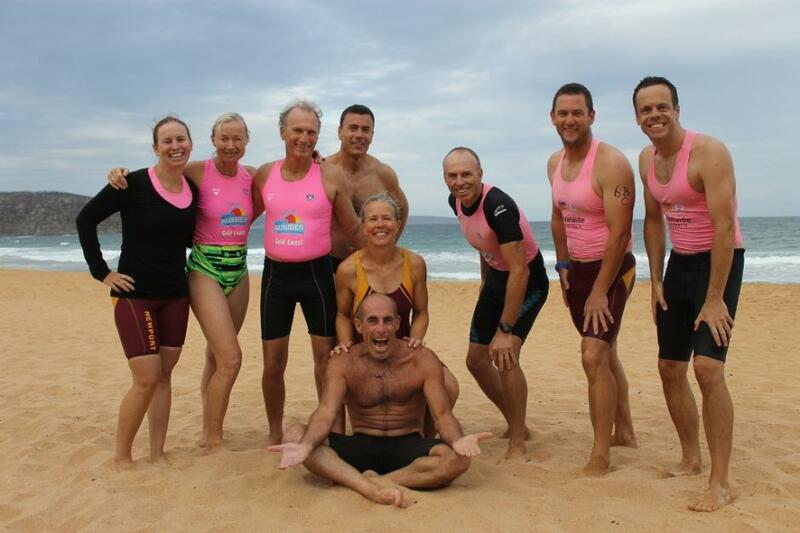 Part of the Newport SLSC Masters Team - 2014.